We are a collective of Nashville based musicians, dancers and teachers. We've incessantly toured, performed, studied, fallen down, gotten back up, won awards, lost awards, and sacrificed just about every creature comfort for the sake of a life in music and art. We know firsthand that passing along the gifts this lifestyle has bestowed us is essential to the future of the music and dance we so love. We are one-hundred-percent dedicated to that mission. Meredith was born in Boston, Massachusetts where, at the age of three, she began studying classical dance at the Boston Ballet School. Through her years of dance performance, she developed a love of the performing arts in general, and sought out an education in theater and music. She was featured in countless productions at the Wheelock Family Theater in Boston, and, as a teenager, she taught classes in acting,movement and choreography at the Harwich Junior Theater in Cape Cod, Massachusetts. She was selected to attend the prestigious National High School Institute at Northwestern University, where she studied Theater Arts, and subsequently received her BFA in Acting and Music from the Tisch School of the Performing Arts at New York University. While attending NYU, she met acclaimed Bel Canto vocal coach Jeff Halpern, with whom she studied privately for seven years. She has performed in, and played music for, many productions with the award-winning off-broadway theater company “Collaboration Town.” In 2009, she was selected as a ﬁnalist in the Telluride Acoustic Blues competition at the Telluride Blues and Brews Festival, and quickly garnered the attention of modern acoustic blues luminaries Chris Smither and Jorma Kaukonen. She has taught guitar techniques, song arranging, and vocal harmony both privately and in workshops throughout the country, and spent three years teaching fiddle at the Junior Appalachian Musicians Program in Black Mountain, NC. Since 2012 she has released two records and extensively toured the US, UK and Ireland with her band Locust Honey. Her original song "Blue" was featured in the 2017 film "The Dinner", and will appear on its upcoming soundtrack. Becky Hill grew up in Michigan, but now calls West Virginia home. She is a percussive dancer, claw-hammer banjo player, square dance caller and budding folklorist. She apprenticed with Footworks Percussive Dance Ensemble and Rhythm in Shoes Dance Company and has studied with percussive dance luminaries such as Rodney Sutton, Eileen Carson, Sharon Leahy, Sandy Silva, Ira Bernstein, and Yiota Peklari and Nic Gareiss. She has won flatfoot competitions at several festivals, including the Appalachian String Band Festival in 2008, 2010, 2011, 2012 & 2015. Becky has taught at traditional music camps across the country including Augusta Heritage Center, CDSS Timber Ridge Camp, Earful of Fiddle Music and Dance Camp, and Black Pot Camp. Some of her favorite stage performances have included the Newport Folk Festival, Wheatland Music Festival, Walnut Valley Festival, and City Folk Festival. In 2013, she was involved in Wheatland Music Organization’s Carry It On Project where she was commissioned to choreograph two dance pieces for the festival’s 40th anniversary. In 2014 & 2015 she was awarded West Virginia Division of Culture and History Professional Development Grants to further her study of percussive dance by working with Sandy Silva in Montreal, Quebec and Yiota Peklari in Athens, Greece. Becky has worked for Augusta Heritage Center of Davis & Elkins College in some capacity for the last seven years and currently serves as their Events Coordinator. There along with noted folklorist Gerry Milnes, she produced a documentary film on West Virginia dance traditions entitled “Reel ‘Em Boys, Reel ‘Em” and cofounded the Mountain Dance Trail Project, a heritage tourism project that connects sixteen rural communities that hold square dances across the state. She organized Dare to be Square West Virginia workshop weekend in 2013, 2014 & 2015 as a means of exposing more callers, dancers and musicians to elder West Virginia Square Dance Callers. While at Davis and Elkins College, she was an Artist in Residence from September 2013-2015 and founded the Appalachian Ensemble, a student performance group that represents Appalachian Music and Dance. Becky served as their Dance Director and had the opportunity to teach Appalachian Dance as part of the US State Department of State Tour “Common Notes: Connecting Folk Traditions through Technology” with West Virginia and Romania musicians. Becky currently performs with Locust Honey, Good Foot Dance Company alongside Emily Oleson and Matthew Olwell, and in an old-time trio with Jesse Milnes, and Kevin Chesser. She is often found calling a square dance, learning tunes and steps from elder musicians and dancers, or teaching children to flatfoot as part of the Nashville School of Traditional Country Music. She believes there is always more to learn and is dedicated to creating innovative choreography rooted in tradition. She hopes her work will bring people together and honor those that have inspired her. Kevin Martin's love for music was sparked at a young age when he learned to play the mandolin in his hometown of Sandy Springs, GA. Not long after being gifted a fiddle from a music teacher, fiddle became his instrument of choice. He moved to Nashville to study at Belmont University in 2008 and shortly thereafter helped form the multi-award winning Old-time group, the Hogslop String Band. With Hogslop, Kevin has helped organize and has played for countless square dances and has performed on the national Bluegrass festival circuit. He has journeyed to compete in both Old-time fiddle and band contests at conventions across the South, Southern Appalachia, and especially at home in middle Tennessee... and he's won several along the way! Aside from performing professionally, he runs his own small business handling royalty administration and licensing for record labels and music publishers. If he's not on the road with Hogslop, you might find Kevin any night of the week playing Classic Country music with Honky Tonk groups around Nashville, or weekly on Wednesday nights at the old time jam he hosts in Inglewood. Multi-instrumentalist Rachael Davis is as renown for her expressive--and explosive--voice as she is for uniting the often desperate worlds of folk, blues, country, and pop. Over a decade career of solo albums and collaborations, the Michigan native has established herself as the best (barely) kept secret in folk music with a poise and confidence on stage--not to mention a song repertoire--that is more associated with veterans with decades of experience. Many established artist for whom Davis has opened for have been struck by the sheer force of her performance--her original and fearless phrasing--which has challenged more than a few of her heroes to step it up when they find she's on the bill. And with Davis' recent relocation to Nashville, TN, the secret of her ascending career as a new and exciting voice in American music seems destined to get out in a big way. Davis has lent her voice to countless recordings for friends as well as for film soundtracks, but it is her intuitive and empathetic understanding of folk music—“the music of folks” as she calls it, and her original and thoughtful songwriting voice that has earned her fans around the U.S. Her clear tone and uncanny memory for just about every song she’s ever heard came early. The daughter of professional folk singers, as a child Davis took to harmony, piano, and ukulele early and at 8, joined the family band Lake Effect, performing regularly at folk festivals throughout her home state of Michigan and around the U.S.
At 20, already a professional and deeply moved by traditional mountain music, blues, and ballads, Davis composed and recorded her debut album “Minor League Deities.” The album won critical accolades in the acoustic music scene and acclaim among folk music listeners. Like many before her, Davis took the road with debut album, settling in Boston, Massachusetts and performing in city subways and the streets of Cambridge--making friends, sharpening her craft, and her wit, while all the time devising a personal way of merging her love for the American songbook with a contemporary view. Because Davis has been swayed by so many different types of music, her style is difficult to file and will not languorously rest amid broader musical genres. "My slant on acoustic music can be explained by a mixed cassette tape that my father played during my early childhood while driving in our family’s Chevy Cavalier station wagon we nicknamed Iggy. On one side of the cassette was the soundtrack for the film The Big Chill. On the other was John Hartford’s “Areoplane”." Today Davis describes her music as ‘Motown-Banjo’. Rachel Davis has released her first Nashville based record titled Bandbox Jubilee produced by Phil Madeira and Lynn Nichols. Jordan Tice is a singular voice on the American roots music scene. Over the last ten years, he has developed a reputation as a unique and versatile guitarist and prolific composer of some of the most thoughtful and well-crafted tunes of his generation. He has released four solo records of original music to critical acclaim and has worked as a sideman to some of the biggest names in acoustic music such as Dave Rawlings, Tony Trischka, Michelle Shocked, the Duhks, and actor/comedian Steve Martin. His current release, Horse County, features his singing and songwriting in addition to his established tune writing and guitar picking skills with a sound that calls to mind the music of Roger Miller, John Hartford, and Norman Blake. In addition to his solo work and work as a sideman he is also a part of the instrumental power trio, Haas Kowert Tice, with fiddler Brittany Haas and bassist Paul Kowert. They released their debut record in 2014 and will be releasing their follow up in 2017. 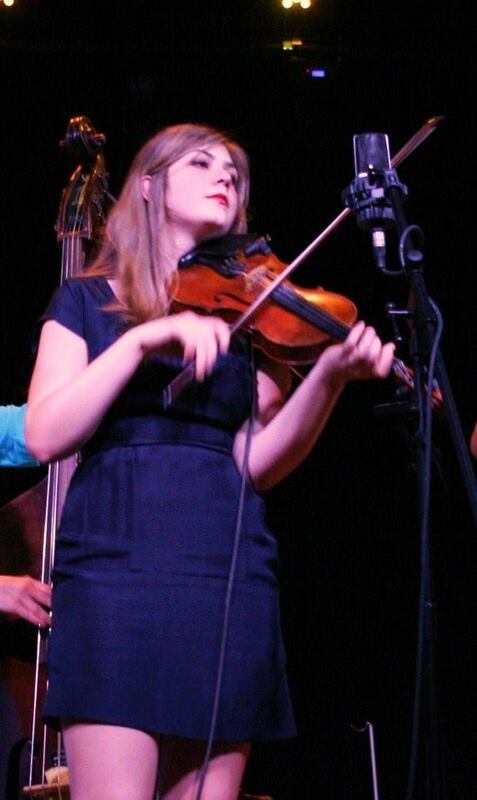 Born in Charlotte, NC, Chloe is a second generation fiddle player and old-time musician. Having moved at a young age to North Georgia, she began studying with Georgia tune connoisseur Mick Kinney at 13. She subsequently spent her teenage years being mentored by renowned fiddle maker and tune collector Joe Thrift, while devoting her free time to a rigorous study of ballet and modern dance. She received a Public Performance Scholarship for Old Time and Appalachian Music at East Tennessee State University, where she attended their Bluegrass, Old Time and Country Music Studies program. As a young adult Chloe travelled through the Southeastern US, studying with a huge number of master fiddle players of different styles. She honed her old-time playing under the tutelage of Rayna Gellert, Brad Leftwich, Bruce Molsky, Bobby Taylor, Ralph Blizard and Mike Bryant, while cutting her teeth in the bluegrass and country worlds with Bobby Hicks, Buddy Spicher and Matt Combs. In 2012 she was a finalist in the fiddle competition at the John Hartford Memorial Festival. In 2011 Chloe formed Locust Honey, and has spent the six years since touring extensively in the US and in Ireland and the UK. Her original song, “When the Whiskey’s Gone” was featured in the 2016 film “Time Out Of Mind,” and her rendition of Clyde Davenport’s “Lost Girl” was highlighted in 2016’s “The Ticket,” which won the US Narrative competition at the Tribeca Film Festival. Hailing from Clay, Alabama, Eric has been playing the Upright Bass since he was 8 years old. He first learned from his father while attending local Bluegrass Jams almost every weekend and Festivals in the Summertime. Eric continued to study music in school, taking private lessons with Cleveland Eaton at the University of Alabama at Birmingham while in the Music Technology program there. In 2003, he was hand-picked to join the Red Stick Ramblers and became an invaluable addition to their brand of Cajun Gypsy Swing. Eric stayed with the band until their final performance in 2014 at the Blackpot Festival, a unique festival-cuisine-culture experience that he continues to help organize. Over the years, Eric has appeared on almost 40 recordings singing and playing many different instruments including Bass, Banjo and Triangle, and has lent his ears to Producing and Co-Producing several projects. His song Bloodshot Eyes was nominated in 2010 for Song of the Year by Offbeat Magazine, and his song Katrina was prominently used in the HBO series Treme as well as the film You’re In Charge. Eric has been featured on 4 GRAMMY nominated recordings, including the 2012 Grammy Award Winning Best Regional Roots category, for The Band Courtbouillon. Eric also has acting experience, appearing in Seasons 3 & 4 of Treme, 2013’s Bonnie and Clyde, and I Saw the Light- a Biopic about Hank Williams. Eric has taught at Centrum Fiddle Tunes, Ashokan, Miles of Music Camp, Blackpot Camp, Augusta Heritage Center, and Maine Fiddle Camp. He continues to run The Blackpot Festival, which he co-founded. Brittany Haas is widely regarded as one of the most influential fiddlers of her generation. Born in Northern California, Brittany grew up honing her craft at string camps nationwide, and developed her unique style of fiddling at the influence of her mentors, Bruce Molsky and Darol Anger. A prodigious youth, Haas began touring with Darol Anger’s Republic of Strings at the age of fourteen. At seventeen, she released her debut, self-titled solo album (produced by Anger). Haas continued to tour and record while simultaneously earning a degree in Evolutionary Biology at Princeton University (where she also minored in Music Performance). It was during her time at Princeton that Brittany was asked to join the seminal “chamber grass” band Crooked Still, with whom she has made four recordings and toured the world. Now residing in Nashville, TN, Brittany is currently involved in many exciting projects. Her trio Haas Kowert Tice (featuring bassist Paul Kowert of Punch Brothers and guitarist Jordan Tice) is gearing up to release their follow up album to 2014’s “You Got This” and continues to tour around the country with their original material. In 2015, Haas began touring with the Dave Rawlings Machine (featuring Gillian Welch) and can be found on their latest release “Nashville Obsolete.” In the fall of 2016, Haas will perform as part of the house string band for Prairie Home Companion, hosted by Chris Thile. Her trio Haas Marshall Walsh (featuring Owen Marshall and Joe K. Walsh) recently released their debut E.P., and Brittany also continues to collaborate with Swedish fiddler Lena Jonsson and percussive dancer Nic Gareiss. In addition to her work as a performer, Haas is an instructor at various string and fiddle camps across the globe, sharing her knowledge and passion in hopes to inspire the next generation of fiddle players. San Diego native John Mailander is an acclaimed multi-instrumentalist and graduate of the Berklee College of Music in Boston, MA. As an accomplished performer, composer, teacher and recording artist, John has become known for his soulful voice on the fiddle, mandolin and various other stringed instruments. John’s interest in music began at a young age, attending the Strawberry Music Festival in Yosemite, CA. The festival, founded on the music and community cultivated by artists like the Grateful Dead, John Hartford and Bill Monroe, drew him in and revealed to him the language, joy and healing power of music. John has since toured and performed with a diverse array of artists in the acoustic music world and beyond, including Darol Anger’s Republic of Strings, Molly Tuttle, Tony Trischka, Col. Bruce Hampton, Laurie Lewis, Danny Paisley & the Southern Grass, Front Country, Missy Raines & the New Hip, Runa, the Alison Brown Quartet, John Reischman, Billy Strings and many more. He was the featured fiddle player in Steve Martin & Edie Brickell’s 2013 musical, Bright Star, for it’s premier run in New York. John is a current member of the acoustic roots music group Joe K. Walsh & Sweet Loam. He is an in-demand session musician, appearing on a considerable lineup of records within the past year alone. His 2014 debut solo album, Walking Distance, features John’s original compositions, recorded with an all-star cast of improvisational musicians from the New England music scene. As an instructor, John has taught at events including the Puget Sound Guitar Workshop, Augusta Heritage Center Bluegrass Week and Nimblefingers Bluegrass & Old Time Music Workshop. John is a dedicated private instructor, teaching students all over the country in person and over Skype. He is currently working on self-publishing an instructional book, A Fiddler’s Guide to Movable Shapes, to be released in Fall 2017. Kristin Adnreassen combines award-winning songwriting and percussive dance in performances that have been heralded “inventive” by the New Yorker and “haunting” by NPR’s Folk Alley. Since coming of age with two of America’s most beloved traditional music ensembles (Uncle Earl and the clogging company Footworks) as well as the "folk noir" songwriting trio Sometymes Why (with Aoife O'Donovan and Ruth Ungar), Kristin has turned her deep knowledge of timeless roots music into a knack for creating original songs with a similar kind of staying power. Following the release of her second solo album Gondolier, Kristin toured solo in support of Black Prairie, Dawn Landes, Aoife O’Donovan, Mipso and Noam Pikelny. This spring, she'll share works-in-progress from new trio recording made with guitarist Chris Eldridge and producer, percussionist and banjo player Shane Leonard. The northeast tour will feature Leonard as well as long-time collaborator and New York-based singer, guitarist and BBC Folk Award winner Jefferson Hamer. Now based in Nashville, Kristin has become a respected voice in songwriter circles, with music recently heard on Showtime’s The Affair and ABC’s Nashville and songs co-written with or covered by Elephant Revival, Julian Lage & Chris Eldridge, Caitlin Canty, Michaela Anne, Joy Kills Sorrow, The Sweetback Sisters, Laura Cortese and Peter Stampfel. Her song “Crayola Doesn’t Make a Color for Your Eyes” hit #1 on the kids' music radio charts and has been covered by dozens of artists ranging from Tyne Daly to high school marching bands. Kristin has been a featured performer on NPR's A Prairie Home Companion; her dancing feet have been heard in the film Cedar Rapids; and NPR's Mountain Stage chose her 2015 performance as one of year's ten best. A Portland, Oregon native, Kristin made her way to Tennessee via Montreal, Cape Breton Island, the Canadian arctic, Maryland, and Brooklyn. As a founding Artistic Director of the popular all-ages Miles of Music Camp, she facilitates life-long learning and community, enjoying nothing more than teaching a pile of square dance beginners how to do a Grand Chain. Singing reminds Maya that she is breathing. Breathing reminds her to be present in her aliveness, and generous in her aliveness, as every breath she takes is shared air. Songs remind Maya that in spite of our unique heartbeats, our universal experiences of joy, longing, belonging, loss, pain, and wonder offer us the opportunity to connect with each other in ways that transcend space and time. Much of Maya's inspiration comes from the interconnectedness, rhythm, and balance of nature. Her work centers around playing with the borders of language and expectation. Maya is just as delighted to revel in the intention and the process of a work of art as she is humbled to stand in the company of the "final" art itself! Maya de Vitry is a multi-instrumentalist and singer living in Nashville, TN, but travels often. Find her on tour with The Stray Birds, or at the lake! Laura Mae Socks has been singing her entire life. Her mother was a country singer and she brought her along to her gigs in bars from age 5. She started playing guitar at 18. In 2004 she formed the band The Hazel Maisy's in Baltimore, MD where she sang/played guitar to the old country songs she learned growing up in Southern Appalachia. In 2011 she moved to SW Louisiana where she lived on a crawfish farm and started writing her own songs while also playing rhythm guitar for a cajun band. She has performed all over the United States in her current band Laura Mae Socks. She currently lives in Nashville, TN, where she performs her original material alongside the country songs she learned as a child.